After their grandfather died, Mikella and Albert basically raised themselves. There was Albert, Mikella, her dog and their father's old pet raven. Long periods of isolation inspired their artistic talents. So when they weren't out tracking, they were drawing, painting or writing stories. Though unable to fly, the disabled raven was constantly getting into trouble and a constant inspiration. The family dog died when Mikella was sixteen. To cheer her up, Albert and his father brought home a scrappy little pup found starving on the Rez (reservation). Stubborn as 'stone', Mikella named the dog after her grandfather Ebenezer. The intense little pup was soon called 'Ebbey' for short. Though less than ideal as a pet, Ebbey's high drive and intensity singled her out as a tracker. Mikella began channeling the pup's wild instincts into searching. Immediately spotting a patsy, the family's pet raven taught Ebbey many new ways to get into trouble. Not that the young dog needed any help. 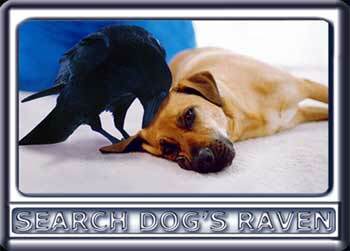 This mutual mischief led to a very strong bond between the raven and the dog. Since the old bird's death, two years ago, Ebbey has been searching for another dog friendly raven. But unlike her lifelong pal, the other ravens keep flying away.